Safety Switch RCDs are designed to monitor the flow of electricity in a given circuit. Under normal operating conditions, the electrical flow in the Active and Neutral wires should be equal. If there is a fault in the circuitry or appliance, causing an earth leakage, an imbalance in the electrical flow occurs. The RCD detects this imbalance and disconnects all power in under 20 milliseconds. There are roughly 15 preventable deaths that occur through electrical malfunction each year, and many more injuries. So it’s clear that making sure your Safety Switches function correctly is a must. 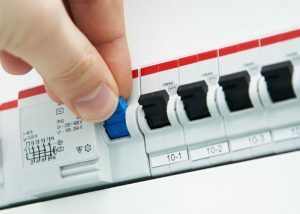 It’s recommended that you test your RCD switches every three months. Correctly functioning RCD Safety Switches are the only type that will protect your family and workers from a serious and grave threat. All of your circuitry is protected by an RCD fitted to your switchboard. Your switchboard area can be accessed. Label and track your RCD circuits to ensure correct data management. Ensure the ‘test button’ functionality of your RCD is operating correctly. Use an RCD test device to make sure your RCD responds in the appropriate time frame (where possible) dictated by the Standard. We will record all results in Quality Assurance Reports. Our practitioners are trained to test and maintain all types of RCD safety devices currently on the Australian market and found in Australian premises. Our customer service is first-class, and we work with complete transparency.